Here we are, at the beginning of Autumn, the roar of leaf blowers and the scratch of rakes filling the air. I do hope those leaves will be composted to make leaf mould! Most of the harvesting is done: potatoes lifted and stored cool and dark in hessian sacks, apples stored in newspaper on trays, carrots and beetroot are more difficult, but will not stand frost – why not pickle the beetroot? 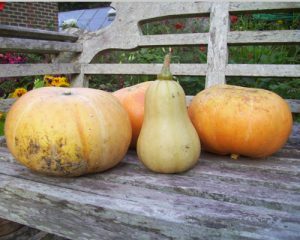 Pumpkins and squash can be stored in a shed or garage once they sound hollow when you tap them. DO rake up and dispose of diseased leaves from below roses and apple trees; DO cut out fruited branches of blackberries and their relations so you can tie in new growth; DO reduce the height of Buddleias, Lavatera and Sambuca to reduce wind rock and snow damage BUT LEAVE the main pruning until March. Most herbaceous plants can be cut own but some have seed heads useful to birds. DON’T cut down Penstemons, Gaura or hardy Fuchsias until late Spring to protect the plant from frost; similarly, leave Hydrangea flowers on the bush until March to protect next year’s flower buds. Now you must drag dead foliage from your pond, my unfavourite job, but if you don’t, the pond will become too fertile for clear water and will eventually turn into dry land! Frogs toads, newts, hedgehogs, slow worms and grass snakes are all great eaters of slugs so I would like them to stay in my garden. An untidy heap of sticks and leaves in a quiet corner will give them somewhere to hibernate. Do, please, remember this before lighting a bonfire! The pigeons will be after your Brussels sprouts and broccoli so protect the plants with net. Enjoy the sight of squirrels, magpies and jays burying acorns, chestnuts and hazelnuts in your perfect lawn! To keep that perfect lawn, maintenance continues with scarification, aeration and Autumn feed. I tend to leave the last mowings down to help the worms and the soil structure; it can look a bit messy though! Autumn sunshine brings out the best in ornamental grass seed heads and maple and beech leaves before they fall. Spare some time to stand (or sit) and stare.